Hillier Press is making available the writings, Lectures, Forums and Seminars of Dr. Alfred Aiken. This website provides an overview of Dr. Aiken's works, which were originally presented in the 1950's and 1960's. Books as well as audio tapes and CDs of his Lectures and Forums are available for purchase. We hope you enjoy browsing this website. 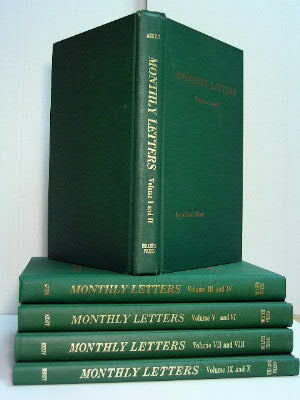 These books are a series of five volumes which consist of the Monthly Letters written by Alfred Aiken beginning in 1959 and ending in 1968. The letters were mailed out to subscribers all over the planet in answer to inquiries on the philosophy of Reality and in response to the numerous requests for "help." To simplify the reading and pondering of these letters they are now in book form with all superfluous information deleted. The philosophy of Reality has nothing to do with "isms" or "systems." It deals wholly in Absolute Truth; therefore these letters are priceless as to the "clarification" of YOUR TRUE IDENTITY.